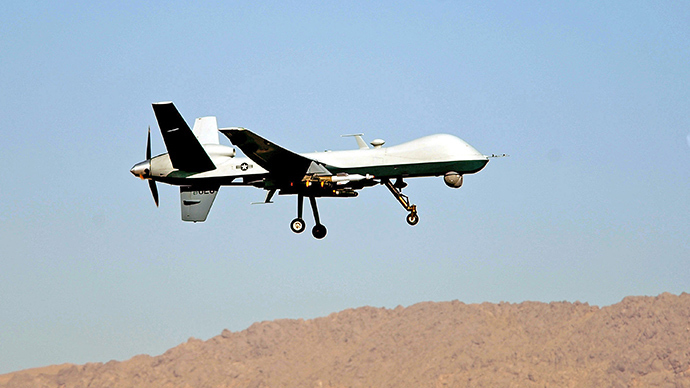 The US military is to get a new drone, small enough to fit into a uniform pocket. 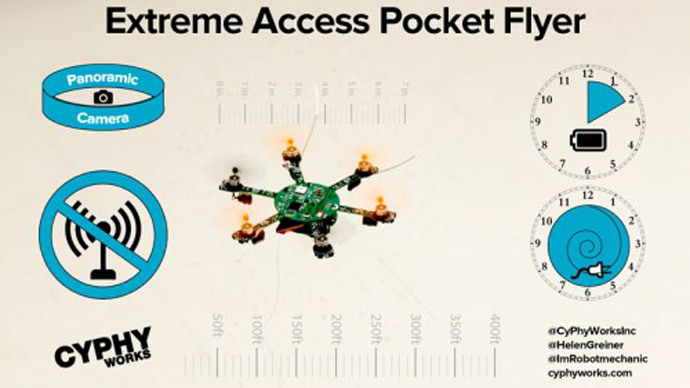 The Extreme Access Pocket Flyer, weighing a mere 80 grams, can fly for two hours, transmitting HD-quality video back the whole time without resorting to Wi-Fi. Developers behind the drone are CyPhy Works, a technology company headquartered in Danvers, Massachusetts. One of their main issues was to get rid of batteries for the small drone to keep it light. But without constant connection to power the drone would stay up for mere 20 minutes. "That's about enough time to go into a building and find a person, and then 'Oh, our robot went dead,’” CyPhy Works founder and CEO Helen Greiner told IEEE Spectrum media outlet. Their ‘magic’ tool is a microfilament tether of about 76 meters, which the device feeds out as it moves. There is no tension in the wire. 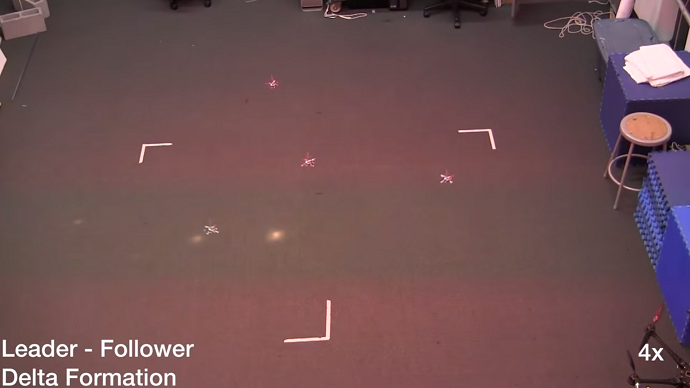 The drone’s base station doesn’t have to move, and could be plugged to the grid to further increase the flying time. Plus, the operator receives his or her HD-video without delay. Moreover, it also secures the drone making it unjammable. "If you see these wireless systems, you can look at the signal, and potentially take control of the vehicle. If you're not that technologically sophisticated, you can actually just put noise into the environment and jam the signals, and the drone will lose control. The microfilament is impervious to that," Greiner said. User control with this drone is carried out using a touchscreen phone or tablet with a special application. Once a mission is complete, the microfilament tether can be replaced with a new one. 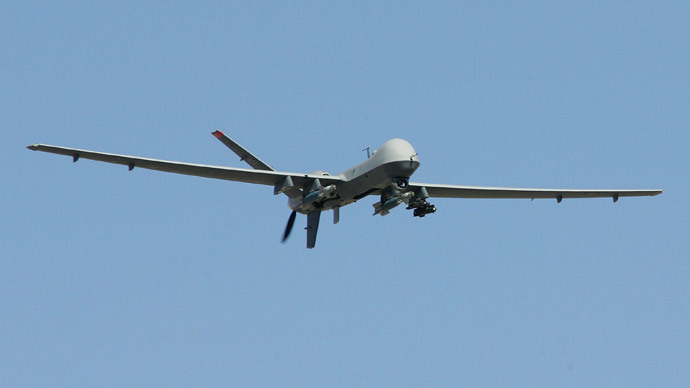 The reason for developing a drone so small is primarily a military one, ensuring that a soldier has a drone with him or her. "We took [our robots] to special forces and IED guys, and they loved them, they wanted them, but the feedback that we also got was, ‘We'd like to carry it more easily.’ It fits into a backpack, and that's great, but what are you going to leave out of the backpack? They need all this stuff,” Greiner pointed out. 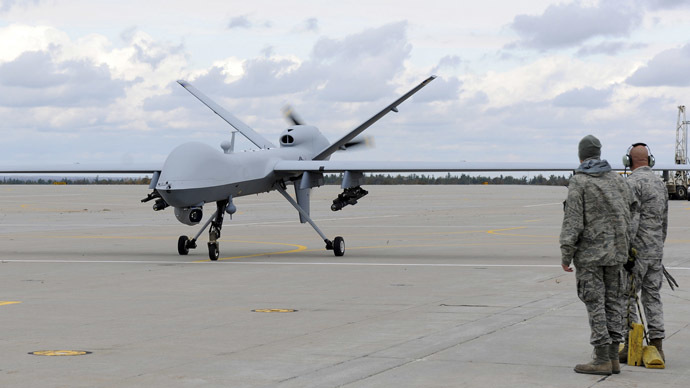 In September, CyPhy Works were awarded with a contract by the US Air Force to help improve search and rescue operations. The target users of the drone are Pararescue, Special Forces and FEMA; it is also expected to come in handy for airborne in-tunnel surveillance systems. “Improvised Explosive Devices (IEDs), frequently placed in tunnels and culverts, are the predominant threat to our military forces,” Matt England, LTC and CyPhy Works vice president of government systems, said in a press release. With the drone, troops won’t have to get out of armored vehicle to carry out a swift and close inspection of a suspicious area, he adds.